While many people feel searching in Windows is less than ideal, 7’s abilities are fairly amazing. The big trick to unlocking them, however, lies in Advanced Query Syntax. 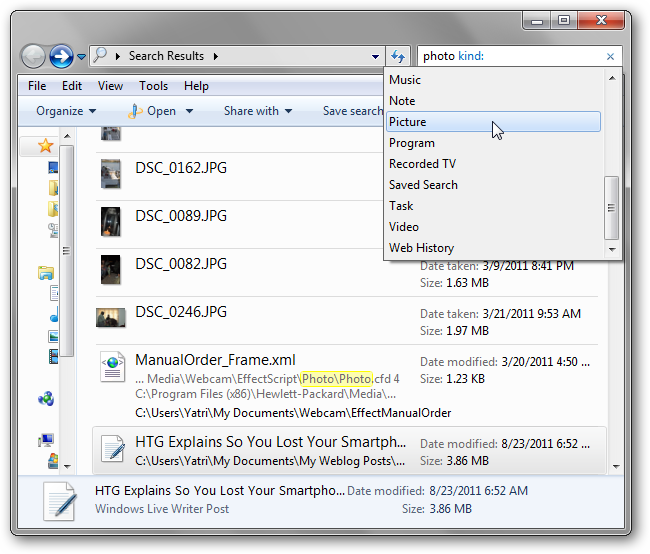 Using these advanced operators can make finding files dead simple. 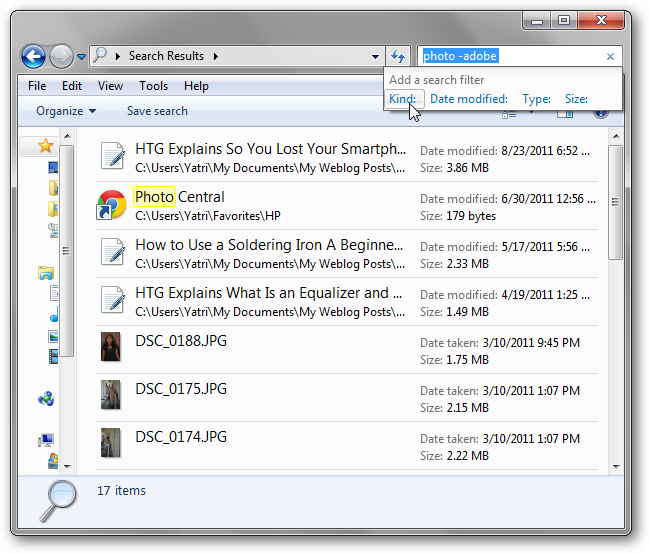 Windows 7 eschews a proper “Advanced Search” option in favor of using Advanced Query Syntax. 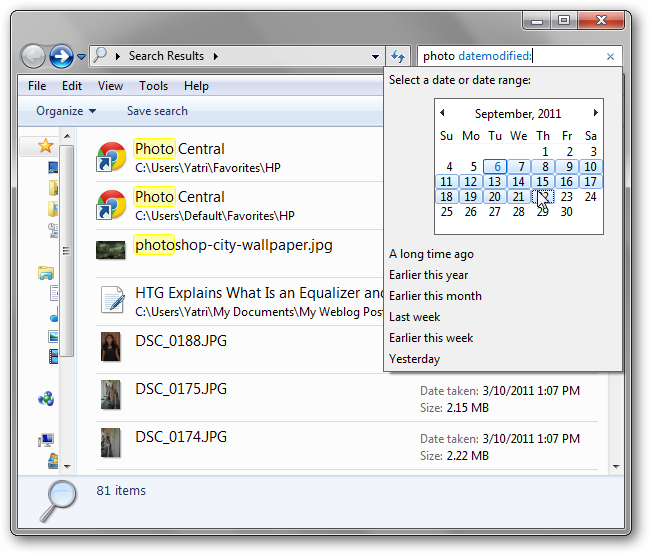 It was developed alongside the Windows Search tool and has been seamlessly baked into 7’s goodness. AQS allows you to use special operators and searching syntax to quickly pare down results. The biggest benefit to this is that if you know the operators, you can find results more quickly because you can type faster than you can click. AQS feeds off of natural language keywords along with specific operators to get the job done. You enter your search terms, you put down an “operator,” then follow up with a “property” that can be mathematical, from a specific list, or from everyday speech. If you refuse to memorize things on principle, though, you don’t need to worry; you can add operators and select properties with the mouse, as well. The best part is you can use AQS anywhere you search, including the two most prominent areas: the Start Menu and in Explorer windows. 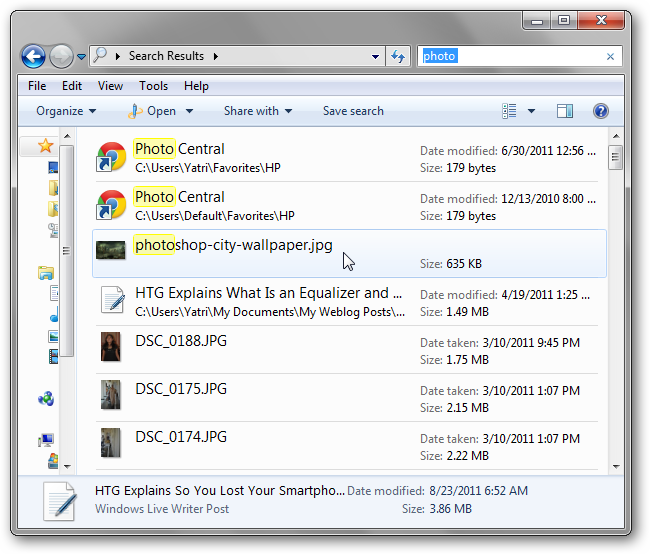 Pop open an Explorer window and search for something. I searched for “photo” because I’m looking for things with that in the title or location. 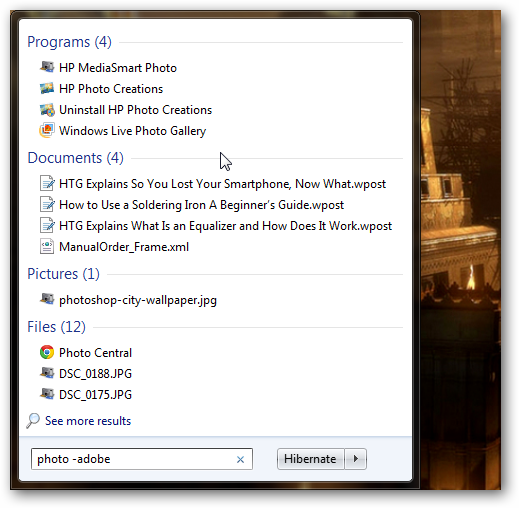 But, let’s say I wanted to eliminate anything that had “adobe” in the title or location? That’s easy! Just add a dash before words you want to “subtract” from your results. You can see that my search options changed a bit. If you want to search for exact phrases, you can use quotes (just like with Google). 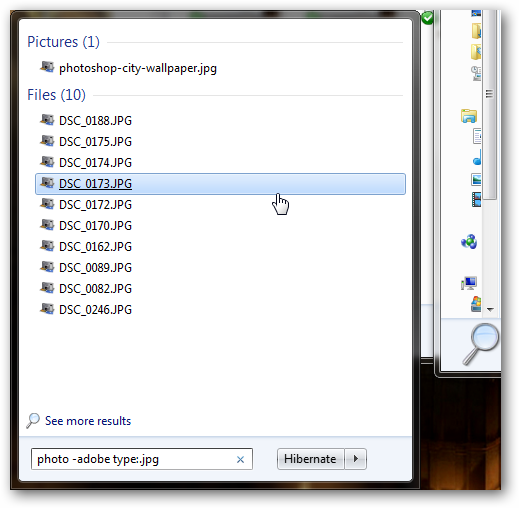 It’s important to note that Windows Search does not differentiate between letter case. NOT/- : Both “not” as well as prefixing a dash will tell your search to exclude items that include the following term. AND/+ : Both “and” as well as prefixing a plus sign will force your search to only include items that match for both terms. “” : Using quotes will force a search to filter for an exact phrase. Let’s take things a bit further and search for a specific kind of file. If you click on the search terms, you should see a box pop up asking if you want to add a search filter. If you select “Kind,” you’ll get a drop-down list of different types of files. “Picture” seems appropriate in my case. You can also choose “Type” instead. Now you can choose a specific extension or a group of extensions for a known type. 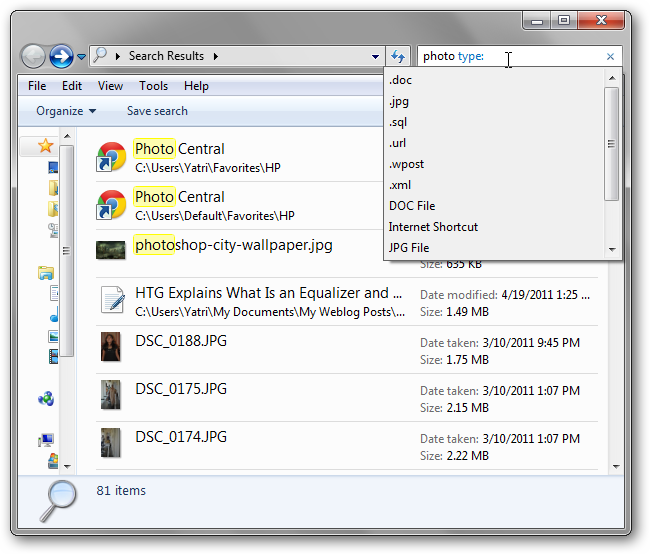 For example, you can search with the extension “.jpg” or you can search for “JPG File.” The latter will pick out “.jpg” and “.jpeg” files. Maybe we knew we had edited the file at some point. Choose “Date modified” and you’ll be able to select a range of dates with your mouse. 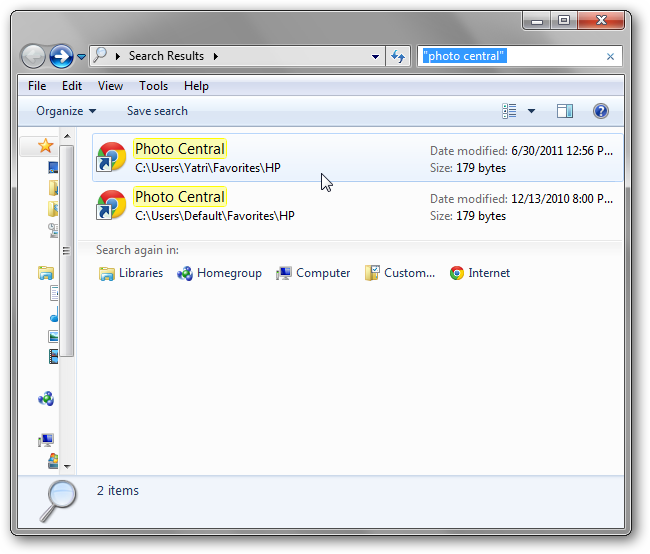 Yes, I searched for modified files from midnight to several days into the future. Sometimes, you just want to be sure. As you can see, AQS accepts a very diverse set of operators and mathematical and natural language cues. The “size” operator has a list of properties that correspond with specific file size ranges. These can come in handy if you know that you resized a pic, for example, and it wasn’t the huge 6 MB JPEG it was originally. You can search with “size:medium” for the smaller file. While your results may seem unaffected for some searches, they may not work properly with others. It’s best to stick to the scheme outlined above. For more information about what operators you can use with AQS and what properties they take, check out Microsoft’s article on Windows Search AQS. Have you found any neat tricks with AQS? Share your search prowess in the comments!